What if your customers were to encounter negative comments when they are searching about your product or service? Rather than positive reviews if they were to first see the negative reviews on the search results? Have you thought about what the impact of such negative comments could be on your business? If you are into any kind of business – offline or online- you are well aware how any negative comment can affect the reputation of your company. It can drive away your prospective clients and adversely affect your ranking on the search engines too. Though we have already dealt with this issue several times in the past, the issue is a recurring one. So let us look at it in a new light and see how you can handle if any negative comments crop up or best how to avoid any such occurrence in the first place. • Be vigilant as that will help you address the negative comment as soon as it crops up. • Adding high quality content on a regular basis ensures that you rank higher on search engine results. • Apologize if needed and resolve the issue with the customer who has turned negative. Research- Your reputation team has to closely keep watch on what is being said about your company. If any negative comment shows up it needs to be quelled as soon as possible. The more the comment circulates, the more the damage for your business. So you need to be aware of any negativity doing rounds. On a daily basis you need to check the social media as comments posted on social media spread like wild fire. You cannot afford to ignore the social media sites like Facebook and Twitter. Content Management- For an impeccable online reputation your content management has to be excellent. Manage your content on all channels available to you. Keep posting regular content not just on your site but on your social media outlets too. The high quality content that you churn out will push the negative comments down and away. Keep constantly monitoring the content on your site and in case you notice any outdated information or any error in the text then have it rectified immediately. Customer Service- A disgruntled customer today has various means to vent his displeasure. So as an astute business owner you need to ensure that such incidents do not occur. And unfortunately if it does, then address and sort out the issue with the customer; never ignore it. Any query or communication directed through your Contact Us page needs to be addressed. If you ignore it then you may be considered rude and uninterested. 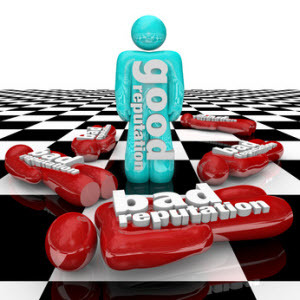 Any person who visits your website is a potential customer and needs to be treated with respect. It is not possible to handle all this on your own. You need an exclusive team devoted to managing your online reputation. If you cannot have an in-house team to do this, then hire the services of professionals to handle the job for you. They will ensure that only positive comments are visible about your company and the negative comments go away from sight.